What is the Litter Kwitter? The Litter Kwitter is a revolutionary new cat litter training kit that helps teach your cat to use the toilet instead of the litter box. Imagine, never having to empty another dirty litter box! In fact, your entire home will become cleaner as a result. No longer will your cat track dirty litter around your home, nor will you have to deal with lugging heavy bags of cat litter from your car to the house. Your cat's feet will stay cleaner and your home will smell fresher. 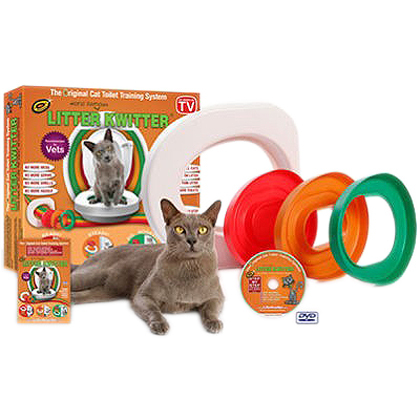 The Litter Kwitter kit includes everything you need to easily help your cat learn how to use the toilet, including a universal base plate which fits all standard width toilets, three color-coded training disks for each stage of toilet training, a comprehensive instruction booklet and an accompanying 30-minute instructional DVD with step-by-step training directions with subtitles in English, Japanese, French, German, Dutch, Spanish, Italian, Portuguese, Russian, Hungarian, Chinese and Thai. The Litter Kwitter is a 3-step cat toilet training system developed to work with your cat's natural instincts to gradually switch from using a litter box to using a toilet. The base plate fits all standard sized toilets and holds 3 different sized color-coded disks that hold cat litter. Your cat is trained by using the toilet-shaped litter pan placed on the floor next to the toilet, then with the full pan placed on the toilet, then changing disks incrementally, each having a larger hole in the center and less litter in the outer ring so that your cat gradually gets used to aiming into the toilet and is weaned off the use of litter to cover up waste. The system has been proven to work for cats of all ages, as long as they are physically able to jump up on the toilet seat and maintain balance. The Litter Kwitter system is ideal for cats or kittens older than 3 months of age. Not recommended for kittens younger than 3 months or cats with mobility issues. Because very small amounts of litter may fall into the toilet during training, it is recommended to use flushable recycled paper litter or crystals. It is not recommended to begin the Litter Kwitter training if you are pregnant or nursing an infant. If you are in a vulnerable group, please consult your physician for advice on cat ownership & dealing with their waste. Remove all other litter trays in your home. Place the Litter Kwitter on the floor next to the toilet. Insert the red training disk and fill with 4-5 cups of litter. Show your cat the Litter Kwitter and put them into it so they can feel that it's got litter in it like their regular tray. Try to do this around the times that they usually go to the litter box. Make sure the door to the bathroom is always left open so your cat can get in. Keep showing them where the tray is for a few days. It should only take 2-3 days to get used to this and they will regularly go to this room to use the Litter Kwitter. At night, keep your cat in this bathroom to help them become adjusted to using their tray there. After a few days, you can move into the second part of the Red Disk stage - getting your cat to hop onto the toilet. Once your cat is regularly using the Litter Kwitter, move to the Red Disk phase by raising the lid and seat on the toilet and slipping the Litter Kwitter on top of the porcelain bowl. Push down to fit securely. The Litter Kwitter is designed for all standard toilet bowls and has adjustable clips to ensure a snug fit. Remove and replace the clips as required to ensure the Litter Kwitter fits securely without any movement. The device must feel solid to give your cat the confidence to proceed. Insert the Red Training Disk if it isn't already in place and fill with litter as before. Show your cat where the Litter Kwitter now is. Put your cat on it so that they understand that it's moved. Again, try to be there when they first go looking for it to make sure they know where it is. Your cat should have no trouble hopping up onto the toilet bowl as cats are naturally nimble. However, if your cat is still young or unusually small you can place a small step next to the toilet to help them jump up. Give your cat at least two weeks to get used to their new toilet being up high. Once they are using this as though it was second nature, it is time to move onto the Amber Disk stage. Make sure you don't rush your cat through the Red Stage. It is important that they do this as a habit to maximize success in the following stages. Next, replace the Red Training Disk with the Amber Training Disk. Put 3-4 cups of flushable litter in the Amber Disk to just below the inner ridge. The inner ridge will help stop litter from falling into the toilet. Show your cat the Amber Training Disk and put them on it like before. Show your cat the hole and place your cat on the tray so that their front paws are on the seat area of the Litter Kwitter and their back paws are on either side of the hole. Your cat will be curious about the hole and will probably peer through it to see what's below. This should be encouraged as it will help them see the water and aim for the hole. Going through the hole will be hit and miss. Sometimes they'll do it and sometimes they won't. Your cat is likely to find it easier to urinate through the hole than defecate at first. Don't worry about this. The main thing they're learning at this stage is confidence and the correct position. When your cat squats to use the toilet, he or she will instinctively move its back paws toward its front paws to gain balance. They will probably keep their back paws in the litter at first but this will change over time to placing them on either side of their front paws on the seat. When your cat is regularly placing both front paws and at least one of its rear paws on the seat and squatting approximately over the hole, this is your cue to move onto the Green Training Disk stage. Make sure your cat is doing this regularly and comfortably before moving on to the next stage. Spend a minimum of 2-4 weeks at this stage. Replace the Amber Disk with the Green Training Disk. Scatter half a cup of litter on the outer edge of the Green Disk up to the ridge. Show your cat the Green Training Disk and put them on it like before. Show them the hole and place them on the device so that their front and rear paws are on the seat area of the Litter Kwitter. Their rear paws may still stray onto the edge of the Green Disk. Let your cat experiment at this stage so they become confident. Let them gain their balance by investigating the Litter Kwitter and try to catch them when they are trying to use it so they understand what to do. Help them get their paws in the right place if necessary. When your cat is using the Green Training Disk comfortably, start reducing the amount of litter to a trickle and experiment from time to time with no litter. Let your cat dictate the pace of the reduction but keep pushing to reduce their need for it to be there. You'll notice your cat will continue to use a scratching motion with their paw as though they are trying to cover something up. This is simply a reflex and doesn't mean that they need to have litter present. You may notice that some of your cat's waste lands on the Green Disk. This is a good thing. It means that they are squatting correctly on the seat and is a cue that it's time to move on to the final step. When your cat is using the Green Disk without any problems and without litter in the Green Disk, place the regular toilet seat down on top of the Litter Kwitter for a couple of days so that your cat gets used to the feel of your toilet seat. If your toilet seat doesn't sit firmly on top of the Litter Kwitter, you can omit this step and simply remove the Litter Kwitter from your toilet. In either case, your cat will now be able to use the toilet just like everyone else in your home. Keep the Litter Kwitter impeccably clean. Do not use ammonia-based cleaners, as this could confuse or bother your cat and discourage training progress. 1 Universal base plate (a special kind of toilet seat that fits all standard width toilets), three color-coded training disks (Red, Amber and Green), and a comprehensive instruction booklet plus a 30-minute DVD with step-by-step training directions.